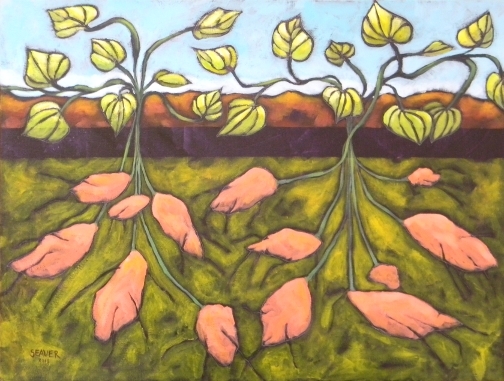 Here's a new painting for my show at Blackstone Coffee, where my work will hang for April and May. I decided for this painting that less was more, and stopped painting early, leaving parts unfinished. The camera gremlins have let me know that it is more difficult to take good photos of less than more. 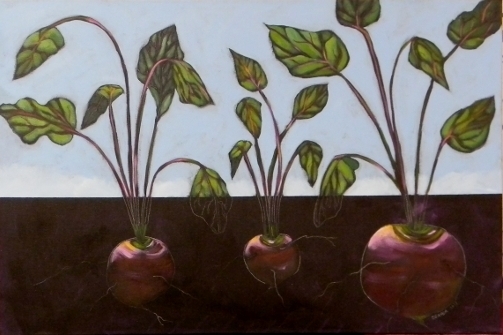 You'll have to take my word for it that in the light this painting has lovely color and the beets sort of float out of the darkness underground. It's a little spooky, in fact, and that's part of what I like about it--it's a surprise. I ate freshly picked beets this spring, and I have developed a new appreciation for this root veggie. Yes, there is an initial dirt taste, but the finish is lovely and sweet, especially if not overcooked. I will be trying them again this spring, if I can get them really good and fresh! 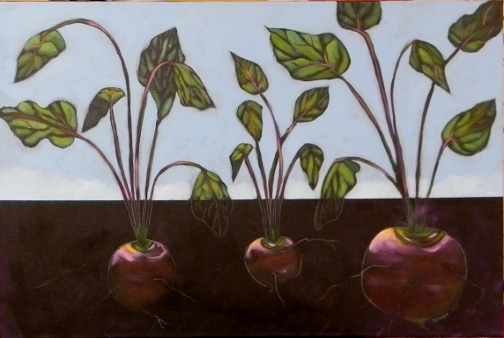 I am back to painting root veggies to go in a show at a fine establishment called Blackstone Coffee next month. Their coffee is fantastic, and the beans are roasted locally. Come out, try their coffee and eats, and see me at the opening, First Friday in April (the 5th) with all my root veggie paintings. I will be in my studio before that from 5 to 7. I'll be posting more as they are finished. Cheers! 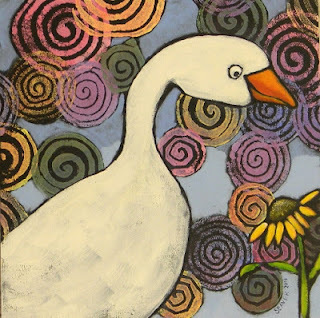 The winner of my card give-away and the one who named my painting is Dorothy. Thank you all for giving such cute suggestions. I liked that one of hers because it hinted at the relationship between the bird and the caterpillar/worm/ space snake. Dorothy, if you will send me an email through my website and give me your address, I will mail you your prize. Watch for new work in the next couple of days. I've been busy! 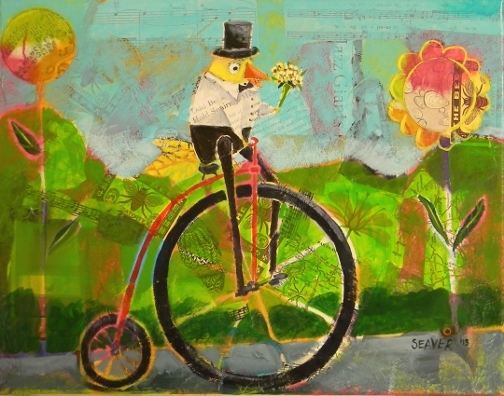 This poor new painting suffers from a lack of creativity from its creator who cannot think of a suitable name for her. 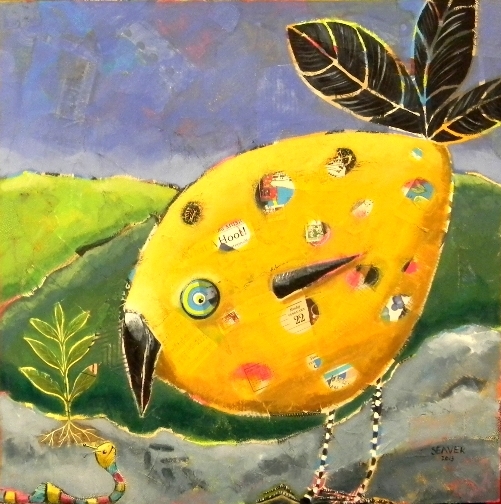 So far, the file is called, Big Yellow Bird. I ask you, does any painting deserve to have such a generic title? Help me. Please comment and leave your suggestions for a title. Keep it clean! And, a word of warning: the critters in my paintings don't feed on each other, so I'm not likely to choose a name that suggests anything so violent. 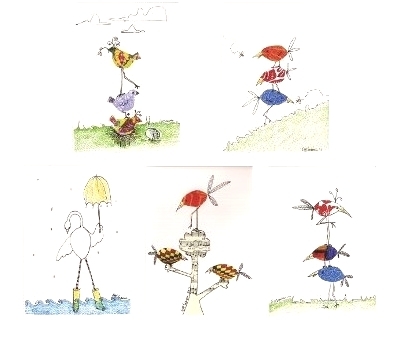 I will send the winner of the title contest a package of my birdie cards as a prize. See below the five designs included in the package. 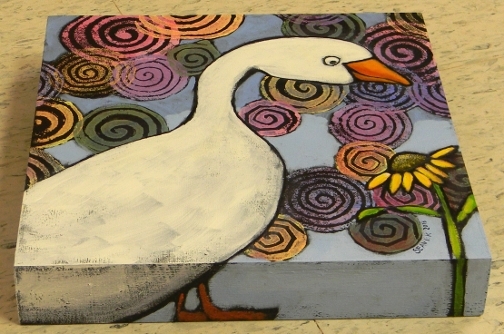 This panel will be up at the Torpedo Factory's Target Gallery for March9-17, 2013, as a joint fund raiser for the March of Dimes and outreach projects spearheaded by the Gallery. Read about it here. Lots of fabulous artists donate to this event, and this Friday, March 15, the night of the big party ($15 admission) the works are only $100 each, rather than $150. All panels are 10 x 10. Go if you can, it'll be a blast. I hope to see you there! Didn't Mean to be Gone So Long! He's promised to bring one of his bikes in for me to see. He has one from 1885 and one from 1889--amazing! If he does it, and I remember that I said this, I'll get some photos and post them here.